People are workers and entrepreneurs, producers and consumers, buyers and sellers. In short, people are assets. With the ever-expansion of governments including the multilaterals and foreign aid, there is rising substitution in the assignment of responsibilities. What used to be personal and parental responsibilities have become government responsibilities. What used to be market functions have become government functions. With the corruption of people’s perception of what is the role of government, many people have veered from self-reliance to state reliance; from hard-working people to subsidy-seeking people. And there is a big army of people who have peddled this corruption and prostitution in the assignment of responsibilities. These are the people in government bureaucracies, both appointed and elected, from local to national governments to international or multilateral agencies. And since government is supposed to provide many if not all to the people, then government will also take many if not all from the people. Government is unlike any ordinary private enterprises that rely on voluntary exchange. In the latter, enterprises and companies have to provide good services and values to the public; otherwise, they will lose their consumers and they go bankrupt. Government is force and coercion. Even if government hires the most corrupt policemen and the laziest bureaucrats, people are forced to pay for them and sustain them until their retirement benefits. So we have a situation where a big army of people peddle the idea that poor people cannot really be self-reliant, that they have to be assisted by the government and the multilaterals from cradle to grave whenever possible, no timetable of those subsidies that are supposed to cover their children, grandchildren, up to the future generations. And since more and more poor people have become “burdens”, their population need to be culled and curtailed. And that is how population control policies, explicit or implicit, have become vogue. And that is how the “Responsible Parenthood and Reproductive Health Bill” has become “pro-poor, pro-people.” Cute. The Economist magazine has produced this nice chart in its September 10th 2011 issue, The Celestial Economy. In 1870 or more than a century and a half ago, Britain was the largest economy in the world, followed by Germany then France. One century after that, the largest economy was the US, followed by Japan and Germany. Last year, China rose to 2nd place and dislodged Japan to 3rd place. By 2030, the 3 largest economies in the world will also be the world’s 3 most populous countries – China, US and India. Although in population size, the ranking will be India-China-US as India’s population is rising fast while China’s is approaching a plateau and is projected to decline by next decade. With the liberalization of information, with global economic integration, with quicker people mobility across countries and continents, people are becoming more productive. Many governments though think that people need to be curtailed economically – hence, the endless business bureaucracies, taxes and fees. And when people become poor and unemployed, governments need to subsidize them by further taxing and bureaucratizing the productive and industrious people. How do we go back to the first formulation above, that people are assets, not liabilities? By asserting more personal responsibility, more individual liberty, and less coercion and substitution of personal responsibility by collective and state responsibility. 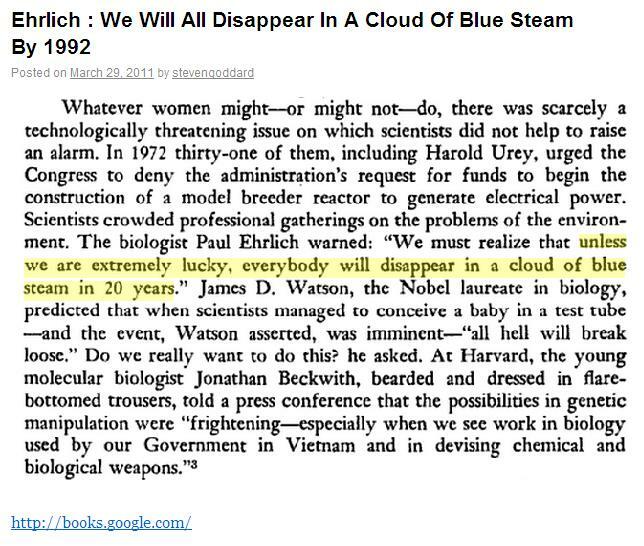 Paul Ehrlich was a famous biologist from Stanford University who enjoyed giving the most dire, the most alarming forecasts about the planet due to high population growth. Below are some newspaper clippings, h/t Steven Goddard blog. He predicted in February 1968 that within 7 years or by 1975, mass starvation would happen, up to "500 million" will starve in the next few decades. Wow! "... and by 1999, US population would have declined to 22.6 million. Wow-wow. 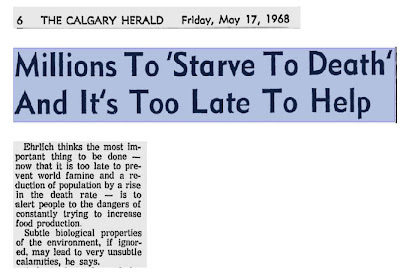 In earlier years, he predicted declining population due to mass starvation. But population will rise to "billion billion". 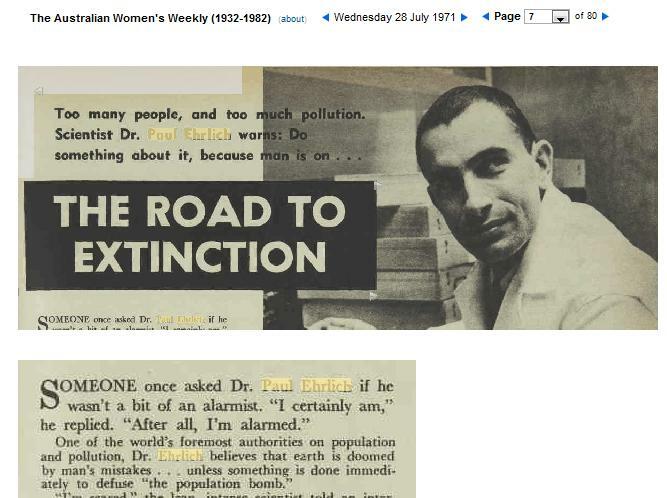 In 1969, he proposed "sterility drugs in reservoirs and in food shipped to foreign countries..." Sterilizing the world. 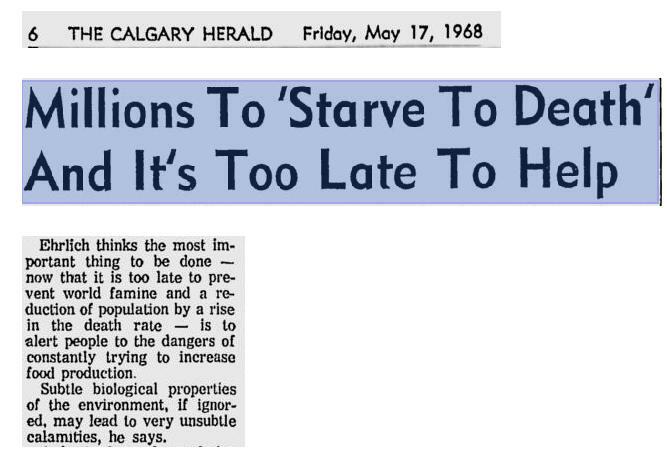 In 1971, he complained of "too many people, too much pollution." So cut high population growth, cut high electricity consumption. The population and environmental alarmism extended to 1972. Governments must do something, like amplify the alarmism, regulations and taxation. 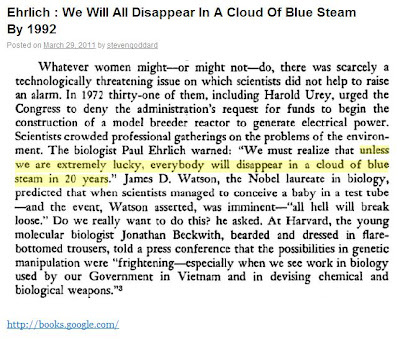 Another prediction made in 1972: unless the world is very lucky, everyone will disappear by 1992. So the world got lucky, we are still here. And the world is wealthier, 19 years after the "Doomsday of 1992." 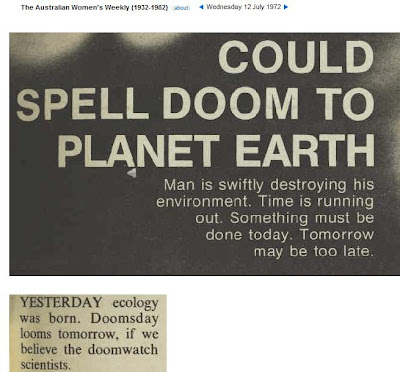 If the track record of the population and climate alarmists are to be assessed, they have very good records: very good in making false and totally wrong predictions. 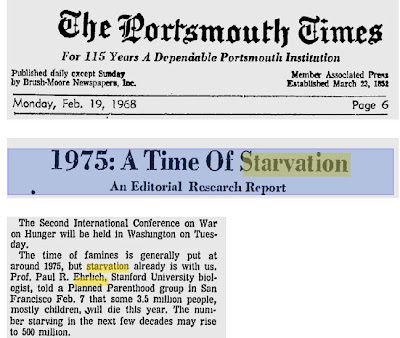 b) Population Control Part 1, September 10, 2011, and Part 2, September 11, 2011.